What Is IPF and What Causes It? 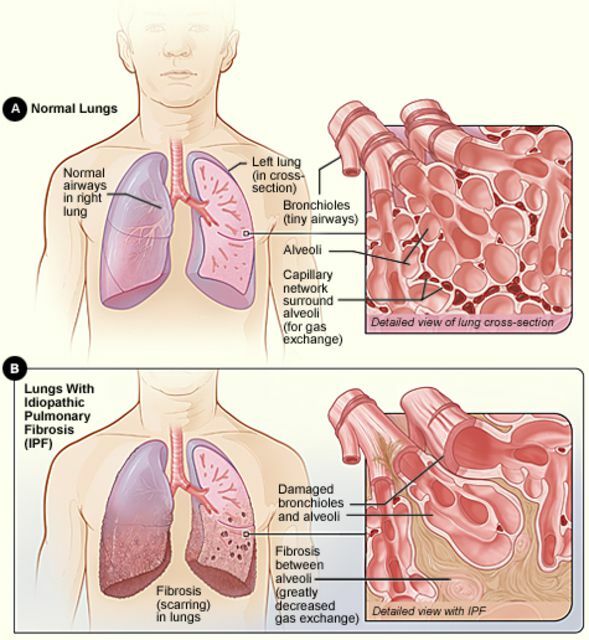 Idiopathic pulmonary fibrosis is progressive lung disease marked by scarring (fibrosis) of the lungs. The first sign is usually shortness of breath, but due to the symptoms being similar to other conditions such as heart and lung disease, the diagnosis is often delayed. By definition, the cause of idiopathic pulmonary fibrosis is unknown, but risk factors can include gastroesophageal reflux, a family history of the disorder, and more. The diagnosis is most often made with a high-resolution chest CT scan. Until 2014 there were no approved treatments, but medications called tyrosine kinase inhibitors can now significantly slow the progression of the disease, at least for a time. Idiopathic pulmonary fibrosis (IPF) is the most common form of a group of diseases known as idiopathic interstitial pneumonia. The term interstitial means that the condition occurs in the areas of the lungs between the alveoli (the tiny air sacs at the end of the respiratory tree where the exchange of oxygen and carbon dioxide takes place) and in the alveolar linings. Fibrosis simply means scarring. It is this scarring in alveolar walls and the tissues between them which interferes with the ability of oxygen to pass through the walls of the alveoli and into the bloodstream. In the past, it had been thought that IPF was an inflammatory process. Now it’s thought that it begins with damage to the lungs from a combination of sources, followed by abnormal healing—fibrosis. To imagine what this is like, you can visualize a cut on your skin which heals with a scar. In many people, a cut heals with a fine red line that turns white with time. In some people, the skin heals abnormally, leaving a thickened and unsightly keloid scar. The fibrosis in IPF is similar to this type of scarring, but not visible outside of the body. Numbers vary when looking at the incidence of idiopathic pulmonary fibrosis, but the consensus is that the condition is under-diagnosed; many people likely have IPF and are diagnosed with another condition, or pass away before the proper diagnosis is made. Looking at estimated deaths from IPF, it was predicted that 13,000 to 17,000 people would die from IPF in the United States in 2014 and between 28,000 and 65,000 people would die in Europe. To put this in perspective, roughly 40,000 people die from breast cancer each year in the United States, making IPF a significant cause of illness and death. In addition to being a progressive disease on its own, a 2015 study estimates that ten percent of people with IPF are expected to develop lung cancer. Symptoms of idiopathic pulmonary fibrosis do not usually occur until significant scarring has taken place. The first symptoms is usually shortness of breath, that may only be noticed with activity early on. As the disease progressed, shortness of breath starts to occur at rest. Other symptoms can include a dry cough, fatigue, rapid and shallow breathing, and unintentional weight loss. Family history (genetic predisposition): IPF does run in families and a few gene mutations appear to increase the risk. There are several known causes of pulmonary fibrosis, such as radiation and medications, but these by definition would not be classified as idiopathic pulmonary fibrosis. There isn't currently a screening test for idiopathic pulmonary fibrosis, but as more people undergo lung cancer screening, it's thought that the disease will be detected more often. The diagnosis can be challenging, and most people have been seeking answers for a year or more before the diagnosis is made. Part of the reason is the symptoms can closely mimic those of heart conditions or other lung diseases. A high resolution chest CT scan is the imaging method of choice for making the diagnosis. Other tests are sometimes recommended to rule out other conditions. When the diagnosis is made, further testing is done to determine the severity of the disease and to plan treatment. This can include pulmonary function tests, especially spirometry, arterial blood gases, and oximetry to determine the oxygen content of the blood. Up until 2014 there were no approved treatments for idiopathic pulmonary fibrosis. While IPF is still not curable, it is treatable, and treatments can improve quality of life and often lengthen survival. In 2014, the medications pirfenidone and nintedanib were approved to treat IPF. These drugs are classified as tyrosine kinase inhibitors and they inhibit an enzyme called tyrosine kinase. Simplistically, tyrosine kinase activates growth factors that lead to fibrosis, so the medications can inhibit this process. With only diarrhea as a common side effects, the drugs reduced progression of IPF by half in clinical trials. The use of lung transplants for idiopathic pulmonary fibrosis is growing, and IPF is now the leading diagnosis among people waiting for a lung transplant. While there are significant risks with transplant, this is the only treatment known to increase survival at the current time. Therapies to improve symptoms and to control other medical issues (such as acid reflux, sleep apnea, pulmonary hypertension, and more) is extremely important in maximizing quality of life with the disease. This may include oxygen therapy, pulmonary rehabilitation, immunizations against flu and pneumonia, as well as connecting with others coping with the disease. For unknown reasons, the mortality from IPF appears to be increasing worldwide. At the same time, new and improved treatments are being developed as research into this disease continues. After diagnosis, and your doctor should work together to find a treatment option that works for your individual case. There are a variety of medications available, and some patients may be candidates for a lung transplant. Additionally, support groups are available where you can connect with others and learn techniques to live better despite having IPF. Ultimately, your active role in your healthcare can make a difference, too. Antoniou, K., Tomassetti, S., Tsitoura, E., and C. Vancheri. Idiopathic Pulmonary Fibrosis and Lung Cancer: A Clinical and Pathogenesis Update. Current Opinions in Pulmonary Medicine. 2015 Sep 18. (Epub ahead of print). Ghebremariam, Y. et al. Pleiotropic Effect of the Proton Pump Inhibitor Esomeprazole Leading to Suppression of Lung Inflammation and Fibrosis. Journal of Translational Medicine. 2015. 13:249. Hutchinson, J., McKeever, T., Fogarty, A., Navaratnam, V., and R. Hubbard. Increasing Global Mortality From Idiopathic Pulmonary Fibrois in the Twenty-First Century. Annals of the American Thoracic Society. 2014. 11(8):1176-85. George, P., Patterson, C., Reed, A., and M. Thrillai. Lung Transplantation for Idiopathic Pulmonary Fibrosis. Lancet Respiratory Medicine. 2019 Feb 6. (Epub ahead of print).